Xconomy: Mega Deals Push 2015 VC to 15-Year High, But Slowdown Looming? Mega Deals Push 2015 VC to 15-Year High, But Slowdown Looming? U.S. venture capitalists poured more money into private companies last year than they had since the height of the dot-com boom, but an investing drop off late in 2015 could signal that the VC gravy train is slowing down. New data out today show that VCs invested $58.8 billion across 4,380 deals in 2015. The dollar total eclipsed the 2014 mark by $8 billion, but investors did 61 fewer deals last year, according to the end-of-year MoneyTree Report. The report is prepared by PricewaterhouseCoopers and the National Venture Capital Association, based on data from Thomson Reuters. Last year’s VC dollar total marked the second-highest amount of the past 20 years, which is as far back as the MoneyTree report tracks data. 2015 was still dwarfed by the nearly $105 billion invested in 2000, but the VC totals of the past two years are still impressive considering investors didn’t dole out more than $33 billion in any single year between 2002 and 2013. In 2015, “megadeals” of $100 million or more continued to drive much of the VC activity. There were 74 such deals in 2015, up from 50 the year before. Four companies—Airbnb, Uber, SoFi, and SpaceX—each raised mind-boggling rounds of $1 billion or more. But smaller investments in younger companies also surged: seed and early-stage companies snagged $20.7 billion last year, up from $16.9 billion in 2014. 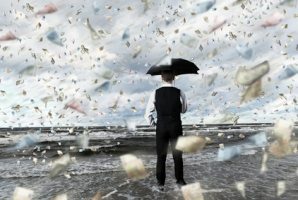 “While a handful of unicorns and late-stage funding rounds by nontraditional investors continue to grab the headlines, more than half of all deals in 2015 went to seed and early-stage companies, with more than 1,400 companies raising venture capital for the first time,” said Bobby Franklin, National Venture Capital Association president and CEO, in a prepared statement. Fourth quarter investment figures were relatively weak, but it’s too early to tell whether that’s an aberration or a sign of things to come. VCs invested $11.3 billion, which was the eighth consecutive quarter that surpassed $10 billion. But it was the lowest total since the third quarter of 2014, and the 962 deals done at the end of 2015 were the fewest since the first quarter of 2013. As has been the case for years, software was VCs’ favorite sector in 2015 ($23.6 billion invested in 1,763 deals), followed by biotech ($7.4 billion across 475 deals). Software dominated the list of top deals for the year. No biotech deals cracked the top 10.